This book is written with the objective for serving the general public. 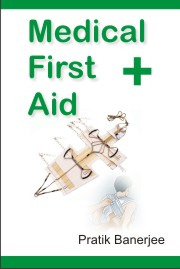 The understanding of medical first aid is made easier with the introduction of numerous diagrams. The first aider would be able to grasp the management and procedures of the condition at a glance, as these parts are highlighted in the book. The book has recent developments in heart, lung standstill conditions (cardiopulmonary resuscitation) and other important areas of first aid. There is a detailed and objective discussion on life threatening conditions. The first aider has to know what is wrong (diagnose) and hold onto the patient till proper medical aid arrives. To help the first aider understand the art of what is going wrong (art of diagnosis) with the patient; there is a discussion on examination of the patient. To enhance the grasping of the subject better, a detailed chapter on the principles of first aid, structure (anatomy) and functioning (physiology) of the human body has been included. The first aider may use the book for reference as it has contents and index listing which is detailed. The book has been made slightly larger than the pocket size for easier handling. Positive and negative feedbacks would be appreciated. The book is written in simple English. It is supported with numerous diagrams which make management easier to understand. It answers the common medical problems of daily life in simple scientific manner. The book is a must for those who are in life threatening activities, e.g. merchant navy and sailing, dangerous sports (mountaineering, boxing, wrestling), fire fighting activities, swimming etc. It explains difficult situations in simple manner, e.g. unconscious patient, burn patients etc. The book has been made into pocket size for easier handling. The book may be utilized as a text or a reference book in first aid for institutions such as, schools, colleges, training institutes and work places.